Vantiv and Quality Media Consultant Group partner up on a one day conference to teach entrepreneurs best practices in entrepreneurship and business development. ATLANTA - April 16, 2018 - PRLog -- Quality Media Consultant Group (QMC Group) will present the 2018 Trailblazer Business Summit on Saturday, April 21 at the Courtyard Marriott in Tucker, GA. This one day conference is expected to attract small business owners and entrepreneurs in the metropolitan area as well as the Southeast. As a sponsor, Vantiv now Worldpay has partnered with QMC Group to reach business owners looking for more effective ways to generate new business, improve financial systems and process payments. The Trailblazer Business Summit is targeted to entrepreneurial trailblazers who are ready to accelerate revenue and get better results in business. The conference will feature 8 speakers on a wide variety of topics including: website sales and search engine optimization (SEO), finances and budgeting, digital marketing, the wealth of health and sales mastery; as well as a power panel on how to use technology to grow your brand and business. A huge percentage of business in America is classified as small business, according to the Small Business & Entrepreneurship Council. In 2014, according to U.S. Census Bureau data, there were 5.83 million employer firms in the United States. Firms with fewer than 500 workers accounted for 99.7 percent of those businesses. Firms with less than 20 workers made up 89.4 percent of businesses. Add in the number of nonemployer businesses – there were 24.3 million in 2015 – then the share of U.S. businesses with less than 20 workers increases to 97.9 percent. "Considering the large number of nonemployer businesses, it was important that our company provide an event platform for entrepreneurs to have access to information that could enhance their business growth and give them access to the latest tools and strategies so they can compete in the global marketplace. That is what the Trailblazer Business Summit is all about," said Lori A. Manns, event host and president of Quality Media Consultant Group. Participants who attend the conference will gain knowledge on a variety of topics and walk away with implementable tools they can use right away to improve business outcomes. 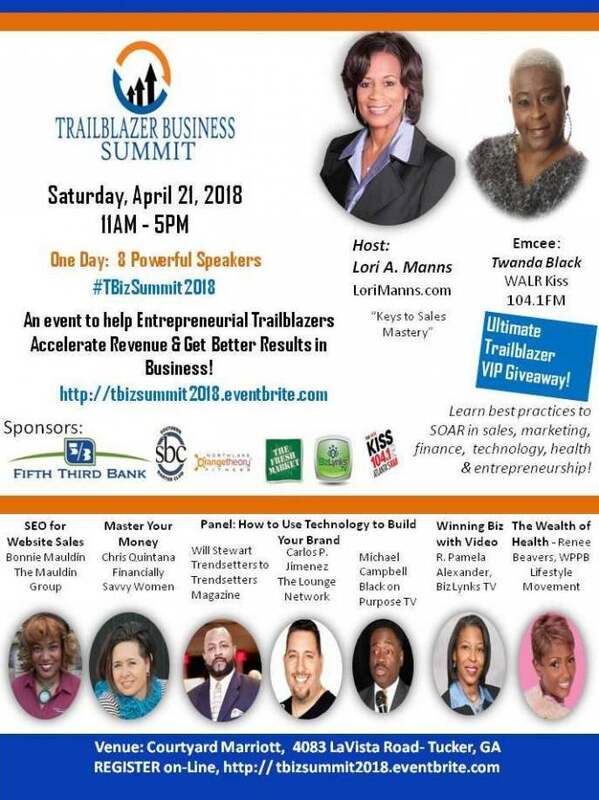 The Trailblazer Business Summit is sponsored by: Fifth Third Bank, Vantiv/Worldpay, The Southern Barter Club, The Fresh Market, Orange Theory Fitness, Chick-Fil -A and WALR-FM. Entrepreneurs interested in attending the event should register on line via the events section at www.qualitymediaconsultants.com. Media interested in covering the event should contact LaTanya O'Kelly at 404-432-0444. Worldpay, Inc. is a public U.S.-based payment processing and technology provider headquartered in the greater Cincinnati, Ohio area. Recently called Vantiv, Worldpay is the largest U.S. merchant acquirer ranked by general purpose transaction volume. From helping businesses integrate points-of-sale, to fueling eCommerce transactions, to activating omni-channel retailing, Vantiv can help. Vantiv is your credit card processor connecting you to all that is possible in merchant services..